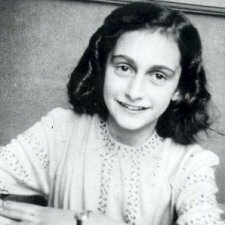 The Anne Frank House in Amsterdam (also known as Anne Frank's Secret Annex or Anne Frank Museum) is where this Jewish girl hid with her family after the Nazi occupation of Amsterdam began. Here, she wrote her world famous diary. Drawing 1 million visitors per year, it's the third best visited museum in Amsterdam (after the Van Gogh Museum and Rijksmuseum). 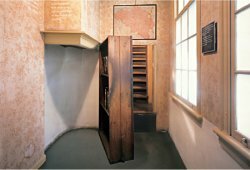 Although in recent years the Anne Frank House has been subject to several restorations and extensions, the Secret Annex (the back side of the house) where Anne Frank and her family hid between July 1942 and August 1944 has been preserved in its original conditions. Together with Anne Frank's original diary, the museum has on display photographs, historical documents and personal objects belonging to the inhabitants of the house that were recovered. Although the rooms of the Secret Annex were emptied of their furniture, visitors are invited to reconstruct the atmosphere of the time and the historical context with the help of diary quotes and explanatory films. The Anne Frank House in Amsterdam is quite small, reason why there's no guided tour. However, visitors are offered guidebooks in many languages that are included in the entrance ticket. Anne Frank's family were German Jews who fled to Amsterdam after Adolf Hitler came to power in Germany in 1933. 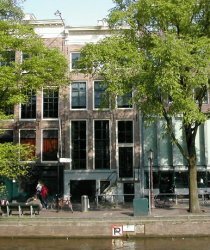 In Amsterdam, Otto Frank set up his own company at Prinsengracht 263. However, in May 1940 the Nazis invaded the Netherlands. Otto Frank tried to escape with his family to among others the United States and England, but this failed. In 1942, Otto made a plan with his non-Jewish employees. They took over his company, and the Frank family went into hiding in the back side (Secret Annex) of the company building at Prinsengracht 263. Anne was 13 years old then. Soon they were joined by another family and a single man. The entrance to the Secret Annex was concealed by a movable book case built in front of the door. Throughout, Anne Frank, the younger of Otto's two daughters kept a diary about the struggles of the eight inhabitants of the Secret Annex and her hopes for the future. Their only support came from the few employees of Otto's companies, especially from Miep Gies and her husband Jan. They would provide the people in hiding with food, clothes and news about the advancement of the war until their arrest in 1944 following an anonymous denounce. All inhabitants of the Secret Annex were put in camps. Of them, only Otto Frank survived. In 1945, Otto Frank, returned to Amsterdam and was given the personal belongings that had been saved by Miep Gies and other helpers during the war. Among those, Anne Frank's diary which Otto Frank published in 1947 and which today is known as Anne Frank: the Diary of a Young Girl. The Anne Frank House in Amsterdam is located behind the Westerkerk at Prinsengracht 263. You can best get there by public transport. Take tram 13 or 17, or bus 170, 171 or 172 and get out at the Westermarkt stop. Then it's a few minutes walking to the Prinsengracht. There is only little (and expensive) parking space available, so traveling by car is not really advisable. The opening times vary considerably throughout the year. As a rule, the visiting times increase during the summer and decrease in winter. Exceptionally, the museum is open on January 1st and December 25th, but remains closed on Yom Kippur. The Anne Frank House runs many activities for children and youth. That's why visitors up to age 9 get free admission and visitors aged 10-17 pay half price. To avoid the often long queues, you can buy your ticket online at www.annefrank.org. However, the Anne Frank House is one of the few Amsterdam museums for which the I Amsterdam card isn't valid. The accessibility for disabled is limited - the Secret Annex is only accessible through a steep staircase. 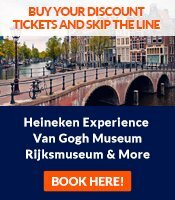 What are the leading Amsterdam museums?